It's time again for The Secret Recipe Club (SRC), and we have a new host: Suzanne from The Bugs on my Windshield. Because SRC's reveal date is Monday, there won't be a Friday recipe this week. This month, I've been assigned Robin from Penny Pinching Provisions who, like me, would rather make tasty, affordable meals from scratch, than buy prepared processed food. There were lots of tasty-looking recipes to review and an easy-to-scan index of recipes to search through. (Thank you, Robin!). 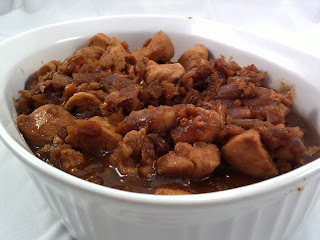 Since we had a dinner with friends coming up, and I tend to use friends as guinea pigs for recipes, as well as family, I decided to make a double-batch of Robin's Ginger Chicken recipe, and add a little bit of Chinese cooking wine to the recipe as well. In a deep pan, heat oil on medium-high and brown chicken on all sides. Set chicken aside. Quickly de-glaze the pan with the cooking wine. Add broth, onion, ginger, soy sauce, molasses, garlic powder, mustard and coriander. Increase temperature to high, and let mixture boil and reduce (stirring occasionally) until onions and garlic are soft (20 minutes). Add the chicken to the mixture, and reduce to medium, stirring occasionally until the sauce thickens and the chicken is cooked through. Yum! I like the addition of the Chinese cooking wine. I'll have to look for some of that. I hope you and your friend enjoyed this as much as we did. Oh my goodness this is making me hungry! We aren't big on processed food ourselves so this would be perfect for us. That sauce sounds heavenly. Maybe I could try it on tofu. I bet your friends loved this. It looks like it has a great depth of flavour. I also much prefer to make things from scratch. Your friends were lucky guinea pigs. Your Ginger Chicken looks like a recipe that we would really enjoy. It is fun cooking with you in the SRC! Hope you are having a great day. This chicken looks wonderful! Such good flavors! I'd love to be a guinea pig at your home, this looks delish. I'm in love with anything ginger! This recipe looks delicious! Thanks for sharing! Daniel, what a wonderful recipe for chicken. Looks so flavorful, love anything Asian. Thanks for sharing. This sounds delicious! I love ginger and I love chicken, so I'm going to be making this soon! I love making braised chicken with Asian flavors, a great make ahead meal. Nice pick for SRC! Delicious sounding chicken! Ginger is the best flavor. Seems like an interesting find. It must've been quite delicious! This looks really yummy. Healthy and easy to make, too. Great choice, Daniel! Ginger-Yum! This looks delicious! Wonderful dish! Looks amazing! I love using ginger! Great SRC choice! thanks for visiting my blog. Thanks for the plug and with such a great recipe! I'm thinking of all the dishes that this chicken can make. Love the versatility! Great SRC pick!! Dontcha' love SRC? Is that really 1/2 cup of ginger? Oh yeah. The original recipe used 1/4 cup. I LOVE your blog, Dan. I have also tagged you in a blog tag. The rules are here - http://divineknits-infiknit.blogspot.com/2012/02/blog-tag.html. It's a lot of fun. I love ginger chicken and this version looks like a winner. Great SRC pick!